The story of, “Opal Essence” begins at an amazing Interior Design store called, “Chintz & Co.” down on Wharf St. in Victoria BC. They had this table…a mosaic table that I coveted. Such a beautiful piece but at a cost of $4000.00 it was way out of my price league. If I was going to have a mosaic table then I was going to have to make one myself. I had a table, a plain ordinary small round table with chrome legs and an oak colored veneer laminate top that was given to me for my 24th birthday. When I was twenty four, my husband (who was then my boyfriend) and I were moving around quite a lot. At that time in our lives we didn‘t want to be burdened down by owning a lot of possessions. We had a motto…If you can’t fold it and fit it into an MGB then we didn’t want to own it. But I had grown weary of always trying to balance things on my lap and broke down and asked for a table for my birthday. Chris obliged and bought me the café style table and chair set. It was one of the best birthday presents I have ever gotten and woe to me…the beginning of the baggage that we seem to collect as we go through life. When we moved from Toronto out to the coast to take care of my husbands’ mother who was dying, the table was one of the things we took with us. My birthday table became the canvas for my mosaic table. I’m always drawn to opalescent things. Maybe it’s because I was born in October and the Opal is the birthstone for that month or maybe I just have a natural affinity for all things opal. So when deciding on the design for my mosaic table I decided to make it an opalescent table. Why wouldn’t I? I bought some opaque opalescent glass tiles and a variety of colored glass stones and got to work. 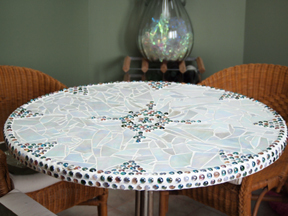 Let me tell you…it takes a lot of time to make a mosaic table. That table in Chintz & Co. was totally worth the four thousand bucks. It’s like putting together a gigantic jigsaw puzzle, finding the right piece for just that spot. Then, once you have it all laid out…picking up each individual piece again and gluing it in place. UGH! It took the entire summer to make the table. 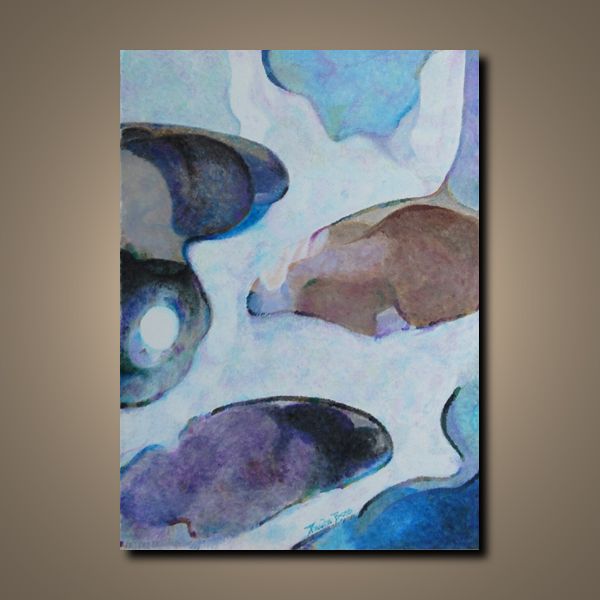 The painting, “Opal Essence” is taken from just the tiniest portion of a photograph I took of my birthday mosaic table.